Chicago residents have been sharing tips about how to avoid coming under attack by dive-bombing blackbirds. Cyclists and pedestrians complain of being pecked after being chased for up to 100m (109 yards) by the creatures. 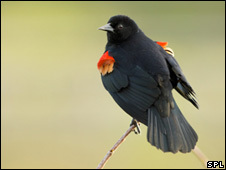 During nesting season, male red-winged blackbirds are known to defend their territory fiercely. Some victims have made comparisons to Alfred Hitchcock's 1963 thriller The Birds, and have named one of the worst offenders after the British director. "Something just came down, pecked me in the head, took my hair and started flying away," said Holly Grosso, a local businesswoman and one of Hitchcock's recent victims. "It's so bizarre. It's this little bird." Chicago ornithologist Douglas Stotz said blackbird attack hotspots included parks and areas along the shores of Lake Michigan. He said angry blackbirds could be deterred by a direct stare. More radical suggestions aimed at fending off the swooping attackers have included mimicking the sound of a barking dog or even imitating a larger bird. "Spread your arms and advance on him," one e-mail advisory suggested. "His pattern recognition will kick in making you look like a dangerous predator, such as a hawk." Another correspondent suggested cyclists should install baskets on their bikes with a cat inside. "Or better yet, wear an oversized helmet with a trap-door with a stealth cat inside." Potential victims are taking new precautions to avoid the birds by changing their commuting patterns or cycling only with a helmet. Although it had been suggested that wearing any form of head covering was enough to prevent attacks, this myth was debunked recently when a man was swooped upon while wearing a baseball cap, the Chicago Tribune reported.